A $100 donation means that the AIDS Services of Austin Helping Hands Food Bank can provide over 6 bags of groceries to clients in the community. A $50 donation will cover the cost of a client’s co-pay at the Jack Sansing Dental Clinic that specializes in dental care for HIV+ people in the community. 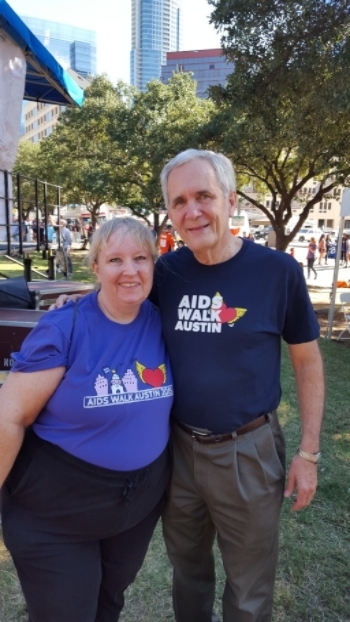 So, if you can donate on my AIDS Walk Austin page, I would be really grateful, and so would the clients of all the agencies that benefit. It would probably take a miracle to get to my goal of $5,000, but we can see a change we all want to if we help out people living with HIV/AIDS, and the good people working to get the Austin area to ZERO new infections. Yep, that really is their goal — zero new cases. I know it seems like a crazy lofty goal, but that’s why I set my crazy lofty goal. I have a head full of dreams, of a world where people get the care they need, and there are no new cases of this disease. So please donate if you can, and here’s the song that inspired me. It is really uplifting. I got a $50 donation from one person, so I’m confident it will work. Thank you so much for sharing it around & for your good wishes!